The cards in the video are some of my ideas and they are a varied assortment, but you can send in some of your own wonderful designs by using the form below. 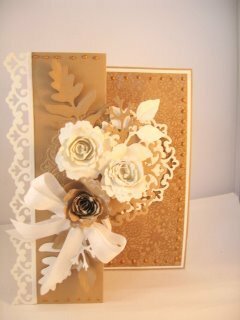 On this page there will be some inspirational card ideas for you to make. Some of them will be added by you, the visitors to this site. This is your chance to let others see what you can do. After all you are proud of the card you have made and you will want to show it off. Tell us how you made it and what it was you used to get the result you are showing. Did you use any special technique on the card, and if you did what was it. What was the occasion and what reaction from the recipient did you get. It is a great compliment to you to have some one like your contribution so much that they want to leave a comment or to make a card the same. Perhaps you will gain some ideas for your future cards from someone elses contribution to the Gallery. Leave them a comment if you do. Your ideas can provide inspiration to future viewers, and I alway love to see the ideas of other card makers. Wether it's for your own family and friends, for charity or to sell, why not share your ideas with others and let us see what you can do. And please add your name as "Anonymous" submissions will not be included. Have you made a card you are really proud of? Have you made a card that is your favourite, something you're really proud of that was a pleasure to produce? Then add it to the Gallery and show it off, but we need to know more about the card than just a one line sentence. Tell us something about you and the cards you make. The size of the card? Which techniques did you try? What type of fold is the card? How did the recipient react when you gave it to them? How did you feel from that reaction to your card? Do you make them for friends and family? Or do you sell them? It is a great compliment to you to have others like your work so much that they want to make it too, and so the fullest description you can give is needed so that others who admire your card can recreate it for them selves. I am very happy to have your submissions to the Gallery, and there are some wonderful cards already on there for you to see, but I need to ask that you add as much info as you can or I won't be able to add them to the Gallery. It is not my intention to offend any one by making this request, but I get many emails asking me about a particular card and because I am not the person who made it I can't answer the query. I hope you understand and will give it your best shot when you submit your cards. Put your photos on the website and let others admire the work you have done. Click the button to browse where you store the photo on your computer. Then select it to add it to your own special page. Click below to see the wonderful creations from other visitors to this page, then add your comments to some of the other submissions that you see. Mothers Day love for Grandma.